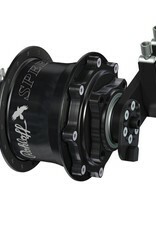 Rohloff's SPEEDHUB is the gold standard for internal gear hubs. High precision manufacturing using top quality materials provides high efficiency, wide gear range, low maintenance, and incredibly long life span. All hub kits come with twist shifter, cables, and 16T chain sprocket. Belt drive sprocket and aftermarket thumb or road brake/shift levers also available. 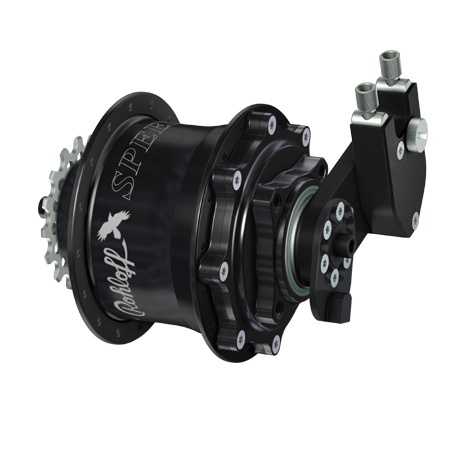 The disc brake version of the SPEEDHUB 500/14 uses a hub cap that has four bolt holes to mount the disc brake rotor. The bolt pattern is specific to the Rohloff hub and requires a four bolt disc rotor. The main hub shell is the same no matter which hub cap is used. Rohloff owners wishing to convert their hub from a rim brake version to disc brake version can contact Cycle Monkey to have the hub cap changed. Note: Compatible only with four-bolt disc brake rotors and must be used with the external gear mechanism. The OEM axle plate is designed only for frames with special Rohloff-specific dropouts. It features a tab that sits securely in the frame’s dropout slots to keep the hub anchored when pedaling. Because of the position of the tab and the force that it must withstand, the OEM axle plate can only be used with frames with deep-slotted, strong dropouts designed specifically for the Rohloff hub. Note: Only compatible with Rohloff-specific frames. Use of the OEM plate with horizontal dropouts/track ends will lead to the frame slot bending open. The external gear mechanism places the shift system in a transfer box just to the side of the frame’s dropout on the non-drive side of the hub, out of the way of the disc brake rotor. The shift cables attach to the cable transfer box, which attached to the gear box with a thumb screw. The external gear mechanism is commonly used with the disc brake version of the hub. It is simpler to install and maintain than the internal gear mechanism, but is also a bit heavier. Although it is ideal for the disc brake version of the hub, it can also be used with the rim-brake version if needed.